In the UK there are 10 million people without access to the internet, four million among the most socially and economically disadvantaged, 39% over the age of 65 years and 38% unemployed. One third of all households do not have the internet and one in four adults have never used the internet. Meanwhile the internet and digital technology command ever greater aspects of our lives. Originally sponsored by Nominet and supported by on-line materials developed by The Tinder Foundation, the Digital Citizen’s Project since September 2011 has been taking the fear out of all things digital for the over-65s in Ash, Epsom and Pirbright; for parents in Sunbury, Sheerwater, Englefield Green, Camberley and Stanwell; for army communities in Sandhurst, Arborfield, Deepcut and Pirbright; for the unemployed in Maybury & Sheerwater, Staines, Stanwell, Camberley and Guildford; and for mental health groups and the homeless in Woking and Guildford. Co-ordinated by Linda Charlton and delivered by tutors, the Project does not depend upon a minimum number signed up, or a fixed location, or inflexible hours or a need to show clear routes of progression. Wherever there is a place to plug in, the technology is transported in: lap tops, a mobile wi-fi hub catering for six laptops if internet access is required, a screen and a projector. Frequently urgent problems have to be solved. An unemployed woman who has been required to use Universal Jobmatch has to enter an email address to renew the password. She is anxious to provide evidence that she has been seeking a realistic job opportunity. The tutor takes an hour to sort it out, finding out what the problem is, visiting the site, looking at the way passwords are changed, and taking the woman through it step by step. The Digital Citizen’s Project has provided time and expertise to overcome such hurdles. Success depends on flexibility. The technology has to move around the county. The tutors oversee nervous learners taking their first steps. The curriculum (Learn My Way) is developing rapidly to meet the needs of the learner. The Project works with community groups, setting up workshops and learning communities. Places like the Job Club in Maybury and the Phoenix Cultural Centre, who attract some of the most nervous learners, are vital to the Project’s success. Their community support workers play a vital role. We are increasingly involved with job-seekers. Some have tried and despaired of ever getting a job. The Project can become the stable part of an otherwise chaotic week, providing someone to talk through a series of problems. Success at IT learning brings relief and hope. The tutors are qualified teachers who work flexibly. They collect, transport and set up the hardware wherever it is needed. They improvise if the technology collapses, get the best out of people who are nervous or under stress or disabled or have memory loss, are good listeners, and make allowances for people not ready to learn. It is extremely skilful work. The Project seeks to instil responsibility for one’s own learning. 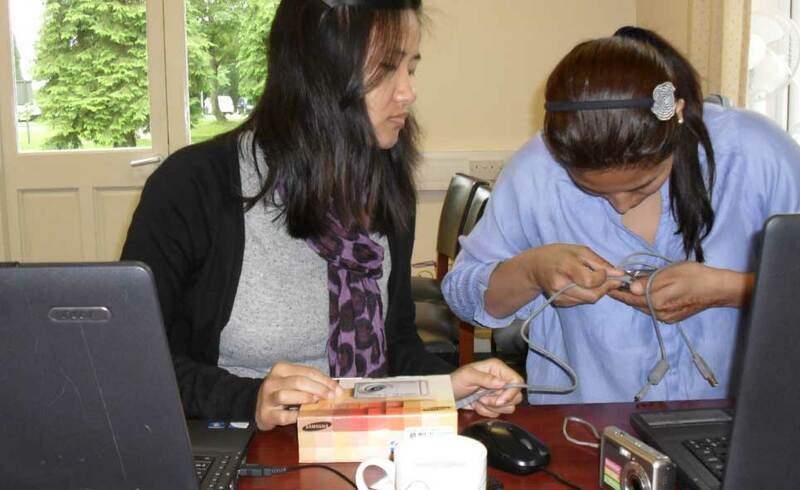 One close-knit group is the Nepalese army wives, supporting each other; organising festive meals, celebrating the end of a course and their achievements, and holding their own presentation evening to receive their certificates. The Digital Citizen’s Project is expanding, working with the Phoenix Cultural Centre, the York Road Project for homeless people, the Wells Centre for over 50s in Epsom, the Shorefield Centre for over 60s in Ash, the Forget-me-not Charity in Guildford. The work is less clearly defined than it used to be but that is a good thing because it is having to adapt to different needs and circumstances. The Project has worked with the NHS doing health checks and with Travel SMART to improve transport choices. Each partner brings its expertise to the wider community’s needs.